In this long post I discuss the shortage of radicalism and broad perspective within the anti-nuclear and nuclear abolition movements in Western countries. This problem arises from a combination of factors: narrow concerns, historical illiteracy, fear of alienating supporters, and conscious and unconscious inhibition to challenge received notions about communism, tyrants, dictators, authoritarians and other assorted demons who, supposedly, must be eliminated before we can make progress on disarmament. The result is a movement that is applauded and respected, but not feared. Progress won’t happen until the movement, and public opinion in the Western world, learn from history and engage with the concerns of non-Western powers, in spite of whatever their shortcomings may be. When I was living through the 1980s, the decade at first seemed like it was only a wasteland. It was a landscape of bad fashion, bad music, and bad movies that all reflected the erasure of the counter-culture and the rise of neoconservatism led by Reagan and Thatcher. It was only later that I came to appreciate what a strange, unique and eventful time it was, in spite of it being so dreadful. With the triumph of retrograde conservatism, events unraveled in ways that shocked even the neo-conservatives who got what they purportedly wanted. They had been trying for years to weaken their communist adversaries, but they seemed to have succeeded beyond their wildest dreams when the Berlin Wall came down in 1989 and the USSR ceased to exist in 1991. It was a classic case of needing to be careful of what you wish for. … we had to wage a struggle in Reykjavik not only with the class enemy, but also with such a representative of our class enemy, who exhibited extreme primitivism, a caveman outlook and intellectual impotence… It is [the belief] that the US might exhaust us economically via an arms race, create obstacles for Gorbachev and for the entire Soviet leadership, undermine its plans for resolving economic and social problems and thereby provoke discontent. Moreover, in this way they hope to limit the possibilities for Soviet economic ties with the developing countries, to create a situation where those countries would be forced to come bowing to the United States. Finally, their mistake is in thinking that with the help of the SDI they could undermine the [strategic] parity and achieve military superiority. Gorbachev has remained a controversial figure at the center of debates about Soviet fates and lost alternatives. Some of his critics in the USSR saw him as the betrayer of socialism, while other domestic critics and foreign friends thought the problem was his commitment to saving the old system. The contradictory Gorbachev-Yeltsin period, from 1985 to 1991, is historically exceptional because it is the only period since the rise of imperial Russia when Russian leaders were not vilified in the West and Russia itself was not portrayed as a strategic threat and unjustly in control of its own natural and human resources. Americans in the political establishment loved Gorbachev when he stayed focused on disarmament and economic and political reform, and they strained to see him as someone who had admitted the fundamental evil of communism, ready to bring his nation into the light of free markets and liberal democracy, but they remained suspicious. An example of this view can be found in Richard Rhodes’ books on nuclear weapons, Arsenals of Folly and Twilight of the Bombs. Rhodes did valuable research on nuclear weapons by going deep into the details of nuclear arms negotiations and efforts to stop proliferation in the post-Soviet world. He is a firm believer in the need to eliminate nuclear weapons, and he spared no criticism of American nuclear policy and the military industrial complex, but he and other anti-nuclear activists seemed to only get this religion when it was clear that the Soviet Union would soon be gone and communism would be “defeated.” Defeating communism always took precedence over disarmament, and that excuse has since been replaced by the need to first remove all “thugs,” “tyrants,” “authoritarians,” “dictators,” etc... before we could get back to disarmament talks. I came to a set of deeply unsettling judgments. That from the earliest days of the nuclear era, the risks and consequences of nuclear war have never been properly understood. That the stakes of nuclear war engage not just the survival of the antagonists, but the fate of mankind. That the prospect of shearing away entire societies has no politically, militarily or morally acceptable justification. And therefore, that the threat to use nuclear weapons is indefensible.” In retirement, Butler joined calls for the total abolition of nuclear weapons. Mikhail Gorbachev was no saint. He came to office fully committed to Soviet Communism, believing that its troubles and failures were the result of the corruption and incompetence of its leaders, not inherent in the system itself. Whether or not he ever completely gave up that belief continues to be a contentious question. Barack Obama was no saint. He came to office fully committed to American Capitalism, believing that its troubles and failures were the result of the corruption and incompetence of its leaders, not inherent in the system itself. Whether or not he ever completely gave up that belief continues to be a contentious question. Now we can see how judgmental and dismissive that little phrase “he was no saint” can be, and how strange it seems to wonder if Obama ever gave up belief in the system that produced him and that he had sworn to uphold. Of course he didn’t give up his belief. One could argue that Gorbachev did indeed give up his belief in his country because he denounced it as totalitarian, but he never gave up on the goal of maintaining the existence of the federation of republics with the word “socialist” in its name. To be precise, Gorbachev's thoughts on the Soviet system are clear. He is famous for his verbosity and lengthy memoirs (critics refer to him as an old windbag). In his memoir, On My Country and the World, he explained his belief in the need to abandon ideological dichotomies between socialism and economic liberalism. He expounded on perestroika’s achievements in economic and political reform along Western models, but also stressed the need to assure that reform had maximum social benefit. Critics on the left who see him as a betrayer of socialism say he failed to see the contradictions that were impossible to resolve. Private property, joint stock companies and multi-party elections would lead to private wealth dominating politics. But regardless of what one thinks about his record, it is difficult to maintain a suspicion that he was “no saint” for having a loyalty to the Soviet system that is presumed to be essentially evil. … a multi-structured, or mixed, economy providing equality of rights among all forms of property. Economic freedom was made into law. The spirit of enterprise began to gain strength, and processes of privatization and the formation of joint stock companies got under way. Within the framework of our new land law, the peasantry was reborn and private farmers made their appearance. Millions of hectares of land were turned over to both rural and urban inhabitants. The first privately owned banks also came on the scene. I chose this example of Rhodes’ anti-communist remark because it highlights a serious weakness of the nuclear disarmament movement. It is full of well-intentioned people who want to abolish nuclear weapons, but many of them focus narrowly on only nuclear weapons. They haven’t uncovered their own ideological biases, educated themselves in politics and history, or thought too much about what needs to be settled between the nuclear-armed nations before they can deal with abolishing their arsenals. Insisting on nuclear disarmament first, before dealing with the ideological biases, inequalities and animosities that cause conflict, is a case of putting the proverbial cart before the horse. On this issue some are naïve, while others cynically wear the virtue badge of the anti-nuclear cause knowing full well that the United States would have overwhelming superiority in conventional military strength in a non-nuclear world, and its adversaries would lose their asymmetric deterrent. 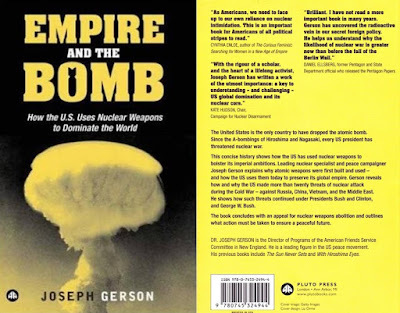 Although an agreement to renounce nuclear weapons as part of a general reduction of armaments would not afford an ultimate solution, it would serve certain important purposes... if the issues between East and West are to be decided in any manner that can give any possible satisfaction to anybody, whether Communist or anti-Communist, whether Asian or European or American, whether White or Black, then these issues must not be decided by war. One of the signatories, Hermann J. Muller, insisted on adding an end note specifying that “general reduction of armaments” must be “a concomitant balanced reduction of all armaments.” Thus there is something problematic in seeing that the underlying belief of many earnest nuclear disarmament proponents is that economic and military imbalances are not an issue, that good capitalism won and evil socialism lost, and that the management of nuclear non-proliferation efforts must naturally be led by United States. Considering the alarming degradation of diplomatic relations, international law and military aggressions of recent American governments, and the fact that nuclear abolition is possible only in the long-term, the immediate concern should be the avoidance of war—which now means an international effort to prevent and contain American aggression and American sabotage of treaties that have kept some measure of stability in international relations. Instead of celebrating its Nobel Peace Prize, the nuclear disarmament movement should feel a little uncomfortable having an award that was also given to Henry Kissinger and Barack Obama. Admittedly, anti-nuclear activists could feel it is worthwhile to accept the Nobel Award for the prominent media coverage, but there is a price to be paid: the movement becomes kenneled into playing a respectable but contained role on the world stage. The statement that “Gorbachev was no saint” needs to be probed further. In this section, I outline some reasons why Gorbachev need not apologize for wanting to preserve his country and the relevance of socialism in the world. I take it a step further by questioning Gorbachev’s eagerness to downplay the achievements of Stalin’s era, a time during which his Gorbachev’s father was a shining example of a manager of a successful collective farm. With their narrow focus on nuclear weapons, Rhodes and others concerned with nuclear disarmament have paid scant attention the damage done to international relations by the dismissal of socialism to the proverbial “dustbin of history.” They neglect the achievements of Soviet socialism and the Soviet Union’s victory over fascism, a threat that Western powers ignored and American corporations profited from during the 1930s. There is little respect paid to the Soviet Union’s successful industrialization, nor to its positive influence in the world as a force against the excesses of capitalism—no acknowledgment that FDR’s “saving of capitalism,” which led to the expansion of social welfare and gains for the working class, came about because of the threat of workers’ revolutions spreading beyond the Soviet Union. Since the disappearance of the USSR, this balancing force has been absent. Neoliberalism has reversed the gains of the mid-20th century and advanced undeterred toward the present crisis of capitalism, with its gross inequality. And this month (May 2018), with an unapologetic torturer confirmed with bi-partisan support as head of the CIA, and sniper attacks on unarmed Palestinians being officially cheered by the American and Israeli government, it is not hyperbole to say WWII was a bilateral, not trilateral, conflict between socialism and fascism, and that the latter has won. It just took a while for the victory to become so apparent. Critics who have subsumed the “communism=evil” belief also show no awareness of the Western-led counter-revolution (the externally imposed civil war of 1917-1922, which continued in other forms until 1991) as a cause of authoritarian rule in the Soviet Union, which was then pointed to as the allegedly innate fatal flaw of socialism. The world will never know if the Soviet system was innately flawed because it was never allowed develop without interference. In particular, critics fail to acknowledge the vast American overt and covert operations of the 1980s to undermine the Soviet Union. As detailed in an obscure article and lecture in 1992 by Sean Gervasi, these programs were reported openly in the New York Times and elsewhere, but they consistently fail to get a mention in studies of the last years of the Soviet Union. Even the Russian history expert Stephen Cohen (who now lives on the margins of acceptable opinion because he argues against the vilification of Russia and Putin) makes no mention in his Soviet Fates and Lost Alternatives of the US-government-funded National Endowment for Democracy (NED), nor other propaganda efforts, as factors in the many theories about the reasons for the Soviet collapse. Perhaps it is impossible to find an American Russia specialists who would discuss these factors because most of them, no matter how neutral or critical they are, have benefited in some form from official support channeled through various endowments and grants. Finally, since anti-communist critics point to the black market and corruption as the fundamental problems of the late Soviet period, a balanced assessment of Stalin’s leadership (often used to denounce the entire Soviet system) would admit that his policies were an effective deterrent in this regard. During Stalin’s rule there was repression and persecution of political enemies, yet the worst violence happened at the top, and the victims were the perpetrators of similar violence during the Bolshevik Revolution. One can deplore Stalin’s methods, but an interesting past hypothetical question to ask is this: What if President Kennedy had employed the same methods to reform the CIA? If you had to choose one person to be assassinated, would you prefer to keep the legitimate head of state, or the head of the CIA who had been operating clandestine, illegal terror operations for the last fifteen years? If Kennedy had lived, would he have followed up on the lofty promises of his 1963 speech at American University? Would he have ended the Vietnam War or prevented the Indonesian genocide (one million dead)? Would a harsh purge of the CIA leadership have prevented the assassinations and mass atrocities that came after 1963? Why does America inflict such violence abroad but live under the illusion that at the highest levels of government battles can be won simply by job dismissal? Kennedy merely fired CIA head Allen Dulles rather than prosecute him for his numerous crimes, so Dulles was back a few years later as a member of the Warren Commission, which, as is well-known, succeeded in its mission to fail to solve the Kennedy assassination case. If we want to stop short of endorsing firing squads, we could at least ask why American presidents fear prosecuting top officials for high crimes, convicting them and sending them to their well-deserved twenty years of hard labor. Then again, perhaps now the Washington establishment has embarked on its own era of institutional warfare, as the FBI, CIA and various state departments are all engaged in intense factional battles, illegal spying on political opponents, and manipulations of the mass media—all aimed at contesting or defending the 2016 election results. During Stalin’s rule, when it comes to the lower-level victims, persecution and cruelty become hard to define. The labor camps included the regular criminal population, and some “gulags” could be also described as new cities being built on the Siberian frontier. The Soviet system promised full employment in a centrally planned economy, so a natural stipulation of that social contract was that the right to refuse a job assignment was limited by practical considerations, though it did exist as an ideal. The right to a job involved also the obligation to work wherever the national plan called for one to work. How could a full-employment policy ever succeed otherwise? The right of refusal would be rather limited in a country that was always under external threat and had urgent projects to complete in the far corners of the realm. In a capitalist system, individuals are “free to choose” unemployment and homelessness, so perhaps homeless encampments should be called an American gulag. For the jobs that exist, market forces drive labor to the places where government and corporate projects offer jobs, and the beauty of this system is that it passes as “free choice” rather than the forced labor migration that it is. Thus it is important to keep in mind that the violent, political repression of the Stalin era co-occurred with industrialization and the massive mobilization of labor to build hydro-electric projects, defeat fascism, construct cities in Siberia, and nuclear bombs in the Urals. We know now from primary source evidence that Yezhov, who was the head of the NKVD, the internal police directorate, acted directly against Stalin’s and the Soviet leadership’s intentions…The loyalty of the military commanders was in grave doubt... The NKVD appeared to be the only force that the Soviet power could rely upon. It did not become clear until much later that Yezhov himself was conspiring with foreign powers to overthrow the government and party leadership, and was using massive executions of innocent people to stir up resentment. For the next year or more Stalin was flooded with reports of conspiracies and revolts from all over the Soviet Union… It is important to ideologically anti-communist researchers that these mass murders be seen as Stalin’s plan and intention. Anti-communist Russian researcher Vladimir Nikolayevich Haustov is honest enough to admit that the evidence does not bear this out. He admits the existence of a major conspiracy by Yezhov and concedes that Stalin was deceived by him. Haustov admits that Stalin acted in good faith on the basis of evidence presented to him by Yezhov, much of which must have been false. Yezhov himself admits this in the confessions of his that we now have. Critics of “Stalinism” have had a tendency to view all human suffering of the time as the evils of a dictatorship. To put things in perspective, it is also worth keeping in mind that labor mobilizations in the United States during WWII often took on the coercive aspects of the Soviet system. The Hanford nuclear site was built partly with prison labor made up of conscientious objectors who had chosen prison rather than military service. Their service was provided to the US government by Prison Industries Inc., which makes the arrangement a notable precursor of the present age when millions of Americans are locked up in private prisons providing cheap labor for corporations. A sort of gulag, perhaps? In May 2014, Roger Keeran and Thomas Kenny discussed their book Socialism Betrayed and the reactions to it since its publication four years earlier. Video link here. 43:02~ [One] democratic aspect of Stalin is, kind of ironically, the repression itself of the 1930s, particularly in 1937. We forget that this repression was accomplished or accompanied by a democratic upsurge in the Soviet trade unions. To fulfill the promises of the 1936 constitution [promulgated by referendum after citizen consultation], the party promoted a democratic upsurge in the trade unions to get rid of corrupt leadership, to root out oppositional elements, and to break what they called leadership cults. People were stealing money from the trade union funds, disrupting production and the delivery of social services. In this one-year period, 1,200,000 people were elected to trade union offices in the Soviet trade unions, and depending on the category, the number of new people elected ranged from 60% to 90%. Many of these trade union leaders who were found guilty of corruption were subsequently punished. The historian Wendy Goldman says this is an example of democratic repression. The idea that repression in 1937 was inflicted on the Soviet Union from above is misleading. The Soviet Union participated in this repression as a way to root out leadership cults, corruption and opposition. See also: Roger Keeran and Thomas Kenny, Socialism Betrayed: Behind the Collapse of the Soviet Union (iUniverse, 2010). There is no major 20th-century political tradition [colonialism, imperialism, socialism, capitalism, neoliberalism] without blood on its hands. But the battle over history is never really about the past—it’s about the future. When [one] accuses the Bolsheviks of waging “war against human nature,” [one] is making the classic conservative objection to radical social change. Those who write colonial barbarity out of 20th-century history want to legitimize the new liberal imperialism, just as those who demonize past attempts to build an alternative to capitalist society are determined to prove that there is none. The problem for the left now is not so much that it has failed to face up to its own history, but that it has become paralyzed by the burden of it. If one delves into the details of “the terror” under Stalin’s rule, one can easily see only the palace intrigue and bureaucratic clans fighting for dominance, and in the process one loses sight of the bigger picture—the work that was being done in defense, industrialization and provision of social security and jobs. Stalin defeated fascism and negotiated the terms of a peaceful post-war co-existence with Franklin Roosevelt, one which Truman and his cold warrior administration sabotaged with tragic consequences. Under Stalin, never was there a goal to create billionaires and value for stockholders. Stalin’s achievements and commitment to the goals of the revolution bought him a lot of patriotic support. For the millions of people who were satisfied with the nation’s progress, the persecution happening within elite circles was invisible or irrelevant. Expecting them to think differently would be like expecting Americans of the same era to lose faith in their country en masse because of conditions on Indian reservations, or because thousands of “promiscuous” women were being put in unlawful detention and quarantined because they had sexually transmitted diseases. Hierarchical structures tilt towards tyranny... but that doesn’t mean that the imperfect hierarchies that we have constructed in relatively free countries, which tilt at least somewhat toward competence and ability, as evidenced by the staggering achievements of civilization... it doesn’t mean that the appropriate way of diagnosing them is to assume... that they’re all about power, and as a consequence, everyone who occupies any position within them is a tyrant or a tyrant in the making. Stalin was the great, effective even visionary CEO of the late USSR Inc. He really turned around that 3rd rate company into a world-conquering juggernaut. He was invincible when it came to office politics, a real master of it. He also cut lots of unproductive fat, employees unwilling to change and upgrade their skill sets. No matter what position you had in the hierarchy, you were always expected to be on your toes and perform! All being said, he was one of the all-time great corporate leaders and titans of humanity! The Communist Party of China has invariably insisted on an overall, objective and scientific analysis of Stalin’s merits and demerits by the method of historical materialism and the presentation of history as it actually occurred, and has opposed the subjective, crude and complete negation of Stalin by the method of historical idealism and the willful distortion and alteration of history. The Communist Party of China has consistently held that Stalin did commit errors, which had their ideological as well as social and historical roots. It is necessary to criticize the errors Stalin actually committed, not those groundlessly attributed to him, and to do so from a correct stand and with correct methods. But we have consistently opposed improper criticism of Stalin, made from a wrong stand and with wrong methods. Critics of Khrushchev’s rule also state that it led to Russia being undone eventually in the 1990s by Western liberal economics and liberal (plutocratic) democracy—a process that reached its dead-end in 1998 with the economic collapse in the final days of Boris Yeltsin’s odious leadership. Critics of the Soviet era tend to overlook the fact that Yeltsin was set to lose to the resurgent communist party in 1996, and he would have lost if not for the massive infusion of cash and meddling in the not-so-sacred Russian democratic process, delivered by President Clinton’s administration. Oddly enough, in the 1990s Russians started to miss having free education, jobs, pensions and health care. As a study by the Lancet noted, economic and political reforms in the 1990s caused seven million excess deaths in Russia. If the logic of anti-communist ideologues were applied, this period would be recognized as a genocide caused deliberately by three American presidents in the 1980s and 1990s, but I’m not arguing here that blame for such atrocities should be pinned with such simplicity only on individual heads of state. The point of writing all of this is not to claim that I have all the answers as to how one should evaluate the achievements of Gorbachev, Stalin, or Mao, or any Western leader. The point was to question the assumption that a problem like nuclear disarmament can be understood and approached with a Manichean world view in which communism is a priori taken to be the great evil and Western liberal democracy was the good that had to prevail before arsenals could be reduced. It is important to make this clear now that the demonization has been refocused in the last quarter century from anti-communism to anti-terrorism, and now from anti-terrorism to a supposed “anti-tyranny” of chosen “great power” adversaries. Nuclear and conventional disarmament has to wait once again because now it is important to oppose the “challenges” coming from Russia and China. They apparently don’t have enough freedom, or their human rights record is lacking, or their military exercises within their borders are threatening to neighbors. Perhaps on some far off magical day they will reach a state of perfection, and then we’ll be ready to talk with them about disarmament. It wouldn’t be such a problem if only American officials had this Manichean world view, but it is also apparent in popular opinion, the media, and in supposedly progressive organizations such as the Nobel Awards, American Civil Liberties Union (ACLU) Human Rights Watch (HRW), Oxfam, Amnesty International, and the International Campaign to Abolish Nuclear Weapons (ICAN). As discussed in an article by David Swanson, these organizations and others have very little to say about the past quarter century of American-led humanitarian interventions that have engendered nothing but humanitarian catastrophes greater than what they purported to fix. Some of these groups have not just stayed silent but rather endorsed some interventions. When they protest against the rush to war, now that Trump is president, they say that only Congress can legally authorize war. They conveniently overlook the fact that the United States government is treaty-bound by the UN Charter to not wage war on sovereign nations. And it is bound by Article 6 of the US constitution to make foreign treaties the law of the land. The problem is not new. The hypocrisy and illegality under international law was apparent to critics in 1898 when the US Congress legitimized the plutocratic insurrectionary government in Hawaii then annexed the occupied Hawaiian Kingdom unilaterally—a preposterous move under international law of the time. After the Fukushima Daiichi meltdowns I became intensely interested in the anti-nuclear movement and became familiar with many writers and activists whom I followed through social media. It was a great letdown to see many of them lend support to mainstream or regressive policies in other areas after having been apparently radicalized on the fight against nuclear technologies. One well-known anti-nuclear journalist in the United States turned out to be a great defender of Israel (on his Facebook page) during the heavy bombardment of Gaza in 2014. As far as I know, he has never written a word about Israel’s nuclear arsenal. Later, in 2016, many anti-nuclear folks got scared of Trump and supported the lesser evil, in spite of the Green Party being on the ballot with a strong anti-war, anti-nuclear agenda. They could not have won, but if people had voted for the policies they endorsed, rather than voting strategically on their fears, the Green Party might have got 20% of the popular vote, and that could have led to a drastic transformation of politics. But instead, many environmentalist, anti-nuclear campaigners, and global warming activists voted for Hillary Clinton—the person who, as Secretary of State, thwarted the Japanese prime minister who wanted to reduce the US military presence in Okinawa. Then in 2011 she acted to prop up the Japanese nuclear industry because of its key role in supporting the corporate military-civilian nuclear complex that underlies a dubious notion of international security. Now some of these supporters of the lesser evil obsess over Russian interference in the 2016 election, oblivious to the fact that this re-animation of cold war tensions makes nuclear disarmament a more distant goal. Beatrice Fihn, head of the 2017 Nobel Peace Prize winner, ICAN, wrote an editorial in Newsweek recently in which she seems to suggest that winning the prize is itself the thing to aspire to, as if it means anything. The title declares, “We Won The Nobel Peace Prize Last Year—Here’s How Trump And Kim Jong Un Could Win It.”  As if they want to! Unfortunately, in her peace plan she sets up a false equivalence between the two countries, as if they were equal powers in the negotiation to resolve the tensions in Northeast Asia. She states, “But there is one way that both Trump and Kim could deserve the Nobel Peace Prize: they must reject nuclear weapons completely.” In writing this she seems to be dangling the prize like a tempting reward, as if the Nobel prize has great strategic value and importance in world politics, and that winning it is a high priority for both Trump and Kim. Trump might enjoy the ego boost if he won it, but it is not his priority, and it is highly doubtful that it means anything at all to Kim. If Ms. Fihn had looked into the record of peace prize recipients, she would know that the only winners from communist countries are Western darlings—the reformers and dissidents who criticized their governments. In the West, it is the opposite. The most egregious example may be the 2010 winner, Chinese dissident Liu Xiaobo, who wrote, “The free world led by the US fought almost all regimes that trampled on human rights … The major wars that the US became involved in are all ethically defensible.” Western dissidents never win, but government officials do. An unusual case was the prize given jointly to Henry Kissinger and Le Duc Tho for the 1973 peace agreement in Vietnam. Mr. Tho refused to accept the award because by the time the award was given, Henry Kissinger had violated the truce for which it was awarded. Given this history, it’s unlikely that Kim Jong Un covets a Nobel Peace Prize. The peace laureate whom Ms. Fihn should have most trouble with is Japanese Prime Minister Eisuke Sato who won in 1974 for his “renunciation for the nuclear option for Japan.” Years later it was revealed that, in spite of public pledges to the contrary, he knew that the Japanese government had a secret agreement with the US to allow nuclear weapons to be stored in Japan. Also, let’s not forget that the International Atomic Energy Agency (IAEA) won in 2005 “for their efforts to prevent nuclear energy from being used for military purposes and to ensure that nuclear energy for peaceful purposes is used in the safest possible way.” That came after nineteen years of the IAEA’s cover-up of the health effects of Chernobyl, two years before the Kashiwazaki-Kariwa Nuclear Power Plant cracked up during an earthquake, and six years before the triple meltdowns in Fukushima. It is laudable that elsewhere in the editorial Beatrice Fihn states it’s time for a bold American leader “to support a new reality based in equality, respect for all lives and humanitarian law. It’s time to pull the beating heart out of the inequitable global security order and replace fear with cooperation.” However, she suggests that before such a leader comes along, “North and South Korea could agree to denuclearize the Korean Peninsula and join the Treaty on the Prohibition of Nuclear Weapons.” In saying this she shows little comprehension of geopolitics, or the fact that there could be no denuclearization of the Korean Peninsula when American submarines, bombers and missiles can “nuclearize” the Korean peninsula at any time on thirty minutes notice. Kim would also hesitate to denuclearize because he knows American agreements, like the promise to Gorbachev not to expand NATO eastward, or the recent Iran deal and the ABM Treaty, are routinely torn up at American convenience. The advantage of one-party states is that leaders stay in power for twenty years and policy is consistent. In the US, new presidents like to reverse the policy of their predecessors. Kim also knows that States like Libya and Iraq were invaded and overthrown once they agreed to de-nuclearize. And even if the United States abolished its nuclear arsenal, Kim might still want a nuclear weapon to deter an attack coming from America’s enormous advantage in conventional weapons. There is no way Kim could make such a peace initiative before that magical bold American leader comes along, and even then, such a leader could be out of power after the next election. This editorial illustrates why ICAN’s campaign has been a sideshow in international affairs. Its supporters are nations that have already signed the non-proliferation treaty (NPT) and had no intention of acquiring nuclear weapons, while the non-nuclear nations reluctant to sign the new treaty are held back by their alliances with nuclear powers. World leaders pay ICAN a polite tip of the hat as a noble effort, but as historian Luciana Bohne has commented, the nuclear ban treaty is “an exercise in futility.” I had to reluctantly agree. To conclude this long harangue quickly, if I could propose where to look for a way forward in disarmament, I would stress that all roads lead to the Pentagon. Those members of Congress, the president, neo-con reactionaries in the cabinet, defense contractors, and lobbyists—they’re no saints, you know? USSR CC CPSU Politburo session on results of the Reykjavik Summit, 14 October 1986, The Reykjavik File (Document 21), National Security Archive, http://nsarchive.gwu.edu/NSAEBB/NSAEBB203/Document21.pdf. The Soviet Union never fit the definition of empire, yet anti-communists often use this term, sometimes adding the adjective “evil.” It did not extract resources and profits from colonies and conquered states for the benefit of the central power. One reason the USSR collapsed was its excessive generosity. The territories of the supposed “empire” received overall more than they gave back, and this was one argument Yeltsin used to promote Russian independence. Andrew Cockburn, “How to Start a Nuclear War,” Harper’s Magazine, August, 2008, https://harpers.org/archive/2018/08/how-to-start-a-nuclear-war/. Richard Rhodes, Arsenals of Folly (Vintage, 2007), 294. Mikhail Gorbachev, On My Country and the World (Columbia University Press, 2000), 58. “The Russell-Einstein Manifesto,” Pugwash Conferences on Science and World Affairs, July 9, 1955, https://pugwash.org/1955/07/09/statement-manifesto/. Hermann J. Muller is an apt historical figure to mention here because he was an American who lived in Moscow during Stalin’s rule. Muller was a pioneer in genetics and won a Nobel Award for his discovery of the harmful effects of x-rays. He warned that no level of exposure to radiation was safe. As a socialist, he found life unbearable in the United States and went to live in the Soviet Union in the 1930s. He despised Nazi ideology, but he believed there could be some positive application of eugenics if it involved free choice of the individual. In Moscow he led a research team but he fell out of favor with Stalin over his views on eugenics. Stalin could not appreciate the difference between Muller’s concept of eugenics and that of the Nazis. Muller returned to the US where he worked as an advisor on the Manhattan Project, without knowing the precise nature of the Project. See this summary of Muller’s 1973 book Man’s Future Birthright (http://www.sunypress.edu/p-513-mans-future-birthright.aspx). Sean Gervasi, “How the U.S. Caused the Breakup of the Soviet Union,” Global Research, January 1992, https://www.globalresearch.ca/video-how-the-u-s-caused-the-breakup-of-the-soviet-union/5619579. Transcript published November, 2017. Stephen Cohen, Soviet Fates and Lost Alternatives (Columbia University Press, 2008). Arch Getty and Oleg. V. Naumov, The Road to Terror (Yale University Press, 1999), 570. For a more accessible source see one of Arch Getty’s interviews on You Tube. https://youtu.be/JsLPtEN62Fg. Saed Teymuri, “The Truth about the Soviet Gulag—Surprisingly Revealed by the CIA,” The Stalinist Katyusha, October 7, 2018. See this article for a detailed discussion of the de-classified Soviet documents on the nature of the prison system in the 1930s and 1940s. Grover Furr, “Grover Furr's BLOOD LIES Disproves Tim Snyder's BLOODLANDS' Accusations Against Stalin and USSR,” YouTube, November 18, 2014. Kate Brown, Plutopia: Nuclear Families, Atomic Cities, and the Great Soviet and American Plutonium Disasters (Oxford University Press, 2013), 28-29. Ted Yates (producer, directory, narrator), “Indonesia: The Troubled Victory.” NBC News, 1967. Transcript posted at this link: http://www.litbyimagination.com/2017/10/nbcs-troubled-documentary-on-indonesian.html. Seumas Milne, “The now routine equation of Stalin and Hitler both distorts the past and limits the future,” The Guardian, September 12, 2002. Milne cites these figures regarding the Stalin era: “799,455 people were recorded as having been executed between 1921 and 1953, and the labor camp population reached 2.5 million (most convicted for non-political offences) at its peak after the war.” These figures are a far less than those of some anti-communist researchers who estimate much higher numbers. Scott W. Stern, “The U.S. Detained ‘Promiscuous’ Women in What One Called a ‘Concentration Camp.’ That Word Choice Matters,” Time Magazine, May 18, 2018, http://time.com/5276807/american-concentration-camps-promiscuous-women/. The Munk Debate on Political Correctness, Toronto , May 18, 2018, 1:46:45 https://youtu.be/GxYimeaoea0. Peter Biskind, “Thunder on the Left: The Making of Reds,” Vanity Fair, March 2006, https://www.vanityfair.com/news/2006/03/reds200603. Editorial, “On the Question of Stalin: Second Comment on the Open Letter of the Central Committee of the CPSU,” People’s Daily, September 13, 1963, https://www.marxists.org/subject/china/documents/polemic/qstalin.htm. Aytalina Azarova et al. ”The effect of rapid privatisation on mortality in mono-industrial towns in post-Soviet Russia: a retrospective cohort study,” The Lancet Public Health, Volume 2, Issue 5, e231 - e238. David Swanson, “Possible New War Opponents,” Dandelion Salad, May 20, 2018, https://dandelionsalad.wordpress.com/2018/05/20/possible-new-war-opponents-by-david-swanson/. Beatrice Fihn, “We Won The Nobel Peace Prize Last Year—Here’s How Trump And Kim Jong Un Could Win It,” Newsweek, May 18, 2018, https://www.yahoo.com/news/won-nobel-peace-prize-last-083819221.html. Barry Sautman and Yan Hairong, “Do supporters of Nobel winner Liu Xiaobo really know what he stands for?” The Guardian, December 15, 2010 https://www.theguardian.com/commentisfree/2010/dec/15/nobel-winner-liu-xiaobo-chinese-dissident. The opinion was published to 2,600 followers on Facebook.